Martin Roll was invited as a guest speaker by the National University of Singapore (NUS) to present and discuss the topic “Global Asian Brands: Myth or Reality” with its MBA students on 6 February 2018. The session was organized by the NUS MBA Marketing Club. The NUS MBA programme is consistently ranked one of the best MBA programmes worldwide by global ranking systems and attracts some of the best international talents. In 2018, the NUS MBA was ranked 18th in The Financial Times Global Rankings and 26th in 2017. During the interactive and inspiring session, Martin Roll discussed some challenges that Asian brands face today in areas such as leadership that is fit for purpose, elevating branding to the boardroom, defining a solid strategic intent, and creating a distinct brand strategy with impact. Martin Roll also explained a few successful Asian brand examples that growing Asian companies and their leadership teams need to pay attention to. He summarized his speech with 10 key drivers to build a successful global Asian brand. Next generation leadership: Leadership is rising up the management agenda in the age of brand building today. Leadership in the 21st century will be influenced by constant change, geopolitical volatility, technological disruptions, and economic and political uncertainty. Therefore, companies aiming at building and sustaining successful Asian brands must ensure that next generation leaders are well-equipped to navigate these major forces of rapid and influential change. Developing a strong strategic compass. Moving up the value chain: Today, Asian products are no longer associated with low-cost, poor quality and considered inferior to Western products and brands. In the past 10 years, Asian firms have realized that they need to move up the value curve and one way to do that is to build their own brands, sometimes even premium brands. To do this, Asian brands have to truly differentiate themselves from the other brands in the global marketplace, which is not always an easy task. There are a handful of Asian brands which have managed to gain sophistication and succeeded in competing effectively on the global level. Singapore Airlines has been at the forefront of the global aviation industry since its early start, and the Singapore Airlines brand and the iconic Singapore Girl has contributed successfully to build the strong nation brand of Singapore. Martin Roll estimates that 20-25% of the nation brand equity of Singapore is a direct result of Singapore Airlines and its consistent efforts over the years. Branding starts in the boardroom: Martin Roll believes that branding and intangible assets should be on the agenda for the entire organization in Asian companies – led by the CEO and the executive team. 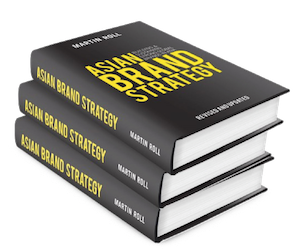 For Asian companies to become successful, branding can no longer be delegated to the mid-level marketing function as is typically the case in many Asian organizations. Defining a solid strategic intent: In today’s crowded marketplace, it is vital for companies to define a distinct, strong and differentiated core as its strategic intent. The strategic intent involves a solid strategy based on sufficient analysis inclusive of adequate insights and data, combined with solid internal and external execution. Business leaders need to be able to precisely determine who their customers are, what they want, and how the company is going to create and communicate a distinct brand offering to their target customers. Martin Roll believes that many Asian brands face the barrier of limited intellectual property (IP) protection in the region, resulting in rampant counterfeiting and infringements of IP rights. Until legislation and law enforcement improve, it will be a major challenge to truly achieve authentication and differentiation. This is necessary in order to build something uniquely Asian – not just replications of successful global brands. By developing the brand on these three pillars, Jim Thompson has been able to maintain its differentiation and build a strong brand. It is perceived to be highly authentic, to have high quality and a strong heritage. Korean beauty company Amorepacific is also another Asian company on the way to becoming a global beauty behemoth with a brand portfolio competing on innovation, quality, marketing and authentic Korean cool. Similar to how Paris and New York are symbolic global capitals of beauty, so much of Amorepacific’s rapidly evolving brand equity is due to its country of origin. One major reason being that Korea is now very much perceived by Asian women to be the role model for Asian beauty. One of its most popular brands in the Amorepacific portfolio is Laneige, which is positioned as a premium cosmetic brand. Laneige is one of the fastest growing cosmetics and skincare brands in China. Huawei is another successful Asian brand which has managed to overcome the challenge of its Chinese country of origin. Over the past two decades, Made in China has often been perceived as low-cost and low-quality with no distinct features or benefits. Huawei has worked hard in producing high quality products and has succeeded in overcoming negative or skeptical perceptions related to the Chinese country of origin. Huawei is currently the world’s second-biggest maker of routers and telecommunications equipment after Sweden’s technology company Ericsson, and its global brand is evolving and building increasing strength in a very competitive sector. Martin Roll summarized his speech with 10 key drivers to build a successful global brand. These steps enable the Asian boardroom and the CEO to focus its attention on the required areas, and serve as checkpoints to be tailored to specific needs and requirements of individual companies.